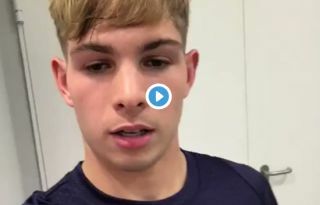 Arsenal youngster Emile Smith Rowe has sent a video message to the club’s fans after scoring his first goal for the Gunners on Thursday evening. The 18-year-old was handed a rare start by manager Unai Emery against Qarabag, and scored a neat goal in the second half to contribute to a 3-0 victory. Smith Rowe was clearly glad to make an impact and addressed supporters afterwards, explaining how he felt to score for Arsenal for the first time and expressing his hope for more goals to come. ‘Hi this is Emile Smith Rowe. Thanks for all of your support,’ he said. A dream night for @emilesmithrowe_ ?